If you don’t know where you are coming from, you don’t know where you are going. The Southern California Medical Museum (SCMM) houses a treasure trove of fascinating medical, dental and pharmacy artifacts, wartime surgery kits, an impressive medical library, medical artwork and photographs, rare and antique bottles that were used to hold and dispense salves, pills, powders and elixirs, unusual and often hard to believe quackery devices and numerous special exhibits. There is even a lifelike diorama re-creation of a doctor and dentist’s office as it would have appeared during the 1910 - 1930’s here in the United States. Museum displays and exhibits include a series of invalid feeders, some simple and some elaborately decorated, designed to provide liquids to patients unable to sit up in bed. Some pieces date back to 1750 and others were still used in the early 1900s. Instruments used during times of war, such as during the Civil War, are also part of the Medical Museum’s collection, with an amputation kit that holds 30-40 medical implements in its original travel case made of rose wood. A wide variety of historical periods, geographic locations and medical specialties are represented in the collection. SCMM is the only museum in southern California dedicated to the collection and preservation of medical artifacts and history of medicine. The Southern California Medical Museum was established in 1982 by Merlin A. Hendrickson, M.D., to provide education on the history of medicine. Originally housed onsite in Colton at the San Bernardino County Medical Society, the Museum was later located in Riverside also in the SBCMS offices. When the Medical Society moved to new offices in Redlands in 2014, the SCMM received an invitation to occupy 2,000 square feet on the Western University of Health Sciences (WUHS) campus. Bert (Hans) Davidson, M.D., Ph.D. serves as the Museum’s director. He is a recognized expert on the Civil War with particular emphasis on the challenges involved in wartime care such as contaminated conditions and commonplace practice of amputation, and he lectures frequently on the topic. Elliot Weinstein, M.D. is the Museum’s Curator and is a practicing pediatrician in the Inland Empire. The SCMM is situated in old town Pomona, close to many other education and art-related establishments in the downtown area. Located on the first floor of Western University of Health Sciences’ (WUHS) Nursing Science Center in Pomona, California, the address is. The SCMM is supported by donations through the Physicians Memorial Gift and Benevolence Fund, a non-profit, 501(c)(3) charitable organization which is part of the San Bernardino County Medical Society (SBCMS). Donations of medical equipment prior to 1925 are welcome and appreciated, as are cash donations which are vital to keeping the Museum available to the community. All donations are considered to be tax deductible contributions to the full extent of the law. (SCMM Tax ID #: 33-0219397). We invite you to tour the Museum individually or a group, consider serving as volunteer or docent (tour guide) or donating towards support of our exhibits and educational outreach. Be a “friend” of the Museum for a donation as little as $25. No matter what your level of participation, involvement is a unique experience that promotes learning about or teaching the history of the glorious art and science of medicine and the early healers who made today’s advanced medical care a part of our current quality of life. TO SCHEDULE YOUR TOUR, MAKE A DONATION OR FOR MORE INFORMATION, PLEASE CONTACT DEBBIE LONG AT DLONG@SBCMS.ORG or 909-273-6000. 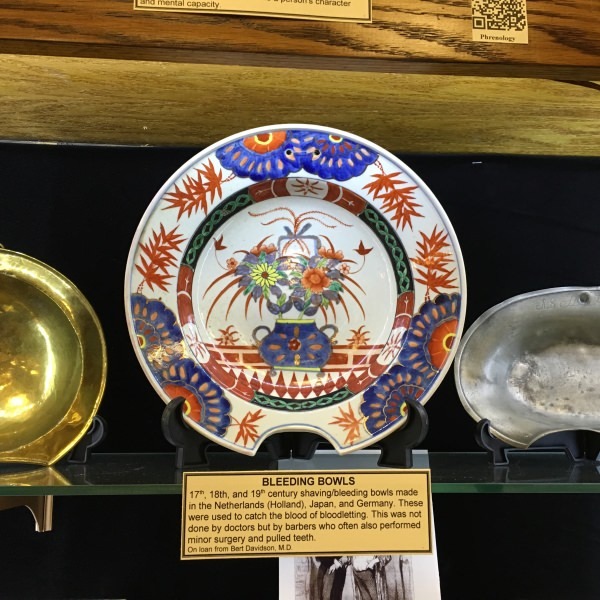 Because of limited gallery space and the policy of changing exhibits, the Southern California Medical Museum cannot promise the permanent exhibition of any object. All items accepted become the PERMANENT PROPERTY of the Southern California Medical Museum and are accepted without restrictions. This unrestricted gift is given with the understanding that the individual items will be used in whatever manner that best benefits the Southern California Medical Museum. Donated items may deaccessioned at a future time in a manner that will best benefit the Southern California Medical Museum. THANK YOU FOR BEING A PART OF OUR MUSEUM! Take a tour, learn, and you will be thankful for modern medicine! Take A Tour! Take Orange Grove Ave. exit towards Garey Ave. Turn left onto N. Garey Ave.
Take exit 45B turn right on to North Garey Ave.